998 points from now, Shaquille O’Neal will pass him for sixth place on professional (NBA & ABA) basketball’s all-time scoring list. With another 2,668 points, Kobe Bryant will do the same. Kevin Garnett trails him by 862 defensive rebounds for third on the all-time list. Until Kevin Love scored 31 points and grabbed 31 rebounds against the Knicks on November 11, he was the last NBA player to record a 30-30- and he last did it 1982. Also, if Love is able to maintain averages of 20+ points per game and 15+ rebounds per game (he’s currently at 21.4 and 15.6), he’ll be the first player to achieve that feat since our mystery legend did it- in 1982-83. 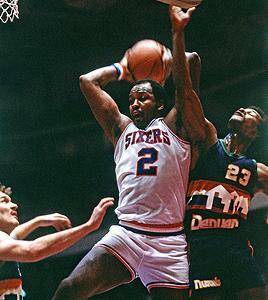 These days, everybody’s gunning for Moses Malone. Unfortunately, however, while Malone stands in the way of every active player and the top of the record books, most fans are woefully undereducated on the body of work of one of the six greatest centers in basketball history. Over the course of a 21-year career (19 in the NBA) that epitomized the term “blue collar,” Malone put together as impressive a resume as any big man in the last 40 years. He retired in 1995 with career averages of 20.3 points per game and 12.3 rebounds per game, 13 All-Star selections, four All-NBA First Team nods (four Second Teams as well), three league MVP trophies (1978-79, 1981-82, 1982-83), two Finals appearances and a championship ring- with the accompanying Finals MVP trophy. In nearly 50,000 minutes in 1,455 regular season games (5th all-time), Malone scored 29,580 points, 9,018 of them (second all-time, behind Karl Malone) in the form of made free throws. More impressive than Malone’s ability to put points on the scoreboard was his ability to crash the boards. He grabbed 17,834 career rebounds, more than anyone other than Wilt Chamberlain and Bill Russell, and according to Bill Simmons’ “Book of Basketball” (and verified by me), in 1978-79 he grabbed 38.4% of the Rockets’ rebounds- a higher percentage than Wilt or Russell ever achieved in their respective careers. Six times Malone led the NBA in rebounding average and total rebounds. During his career, he ranked in the NBA’s top five in Total Rebound Rate and his 19.8% career rate is good for fourth all-time. As good an overall rebounder as he was, Malone did the majority of his work on the offensive glass. He is, without a doubt, the greatest offensive rebounder the game has ever seen. Nine times- once in the ABA, as a 19 year-old rookie, and eight times in the NBA- he led his league in offensive rebounds. His 7,382 offensive rebounds (not kept as a statistic in the NBA until 1973-74) not only top the all-time list, but are a ridiculous 53% more than Artis Gilmore’s second place total of 4,816. For 15 consecutive seasons, he averaged at least 4.5 offensive rebounds per game, with four seasons of 6+ offensive rebounds per game and two of at least 7 offensive rebounds per game. It should come as no surprise that Malone is the owner of the top three (and five of the top 10) single-season offensive rebound totals, as well as four of the top nine seasons for Offensive Rebound Rate. He ranked in the top four in Offensive Rebound Rate 16 times in his career and ranks third all-time with a career rate of 16.3%. In each of 12 consecutive seasons beginning in 1977-78, he averaged at least 19.4 points and 11.8 rebounds per game. During his seven-year prime (1978-1985), Malone averaged 26- 14.8- including seasons of 27.8- 14.8 (1980-81) and 31.1- 14.7 (1981-82)- and never averaged worse than 22.7 points or 13.1 rebounds. In the postseason, where legends are made, Malone was no less a beast. Most fans are at least somewhat familiar with his work in 1983- if you’re not, stay tuned- but in 13 postseason games in the spring of 1977, at age 21, he averaged 18.8- 16.9, as the Rockets came within two wins of a conference title. Four years later, he led the Rockets to within two wins of their first NBA title, averaging 26.8- 14.5 in 21 postseason games. So, what was it that kept Moses Malone from the household-name status his resume warrants? Constant relocation. Despite being the only player in NBA history to average 20- 10 in a season with four different teams (Rockets, Sixers, Bullets and Hawks), and leading two of those teams (Rockets, Sixers) to the Finals, Malone is a man without NBA roots- pro hoops’ most accomplished nomad. 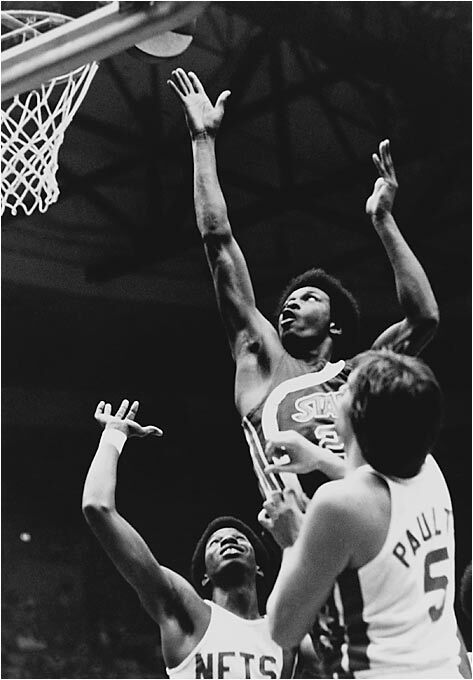 The fifth player to make the leap to the pro basketball straight from high school, Malone was drafted in 1974 by the ABA’s Utah Stars, with whom he spent his outstanding rookie season (18.8- 14.6, 57% FG), before moving on to the Spirits of St. Louis, with whom he also spent one season, the ABA’s last before its merger with the NBA. He was drafted by the Portland Trailblazers in the ABA Dispersal Draft, but traded to the Buffalo Braves before ever taking the floor for the team. His stint in Buffalo was not much more illustrious, lasting all of six days and seeing Malone take the floor for a total of six minutes. In October 1976, he was traded again, this time to the Houston Rockets, in exchange for a pair of first-round picks. In a great six-year run in Houston, he averaged 24- 15, won a pair of league MVP awards and led the Rockets to their first-ever Finals appearance in 1981, but was dealt to Philly following the next season, despite winning the league’s MVP award. His first season in Philadelphia, playing alongside Julius Erving, Andrew Toney, Maurice Cheeks and Bobby Jones, Malone didn’t miss a beat, averaging 24.5 points and a league-high 15.3 rebounds per game, and winning his second consecutive (third overall) MVP award. Malone remains the only NBA player (unless LeBron does it this year) ever to win consecutive MVP awards with different teams. That spring, his fairly tale run in Philly continued, as the Sixers won 12 of 13 postseason games and totally dominated the defending champion Lakers (who’d beaten them in 1982) in the Finals. Malone averaged 26- 15.8 in the 1983 postseason and was named the Finals MVP. This is remembered as the “Fo, fo, fo” playoff run, made famous by Malone’s prediction that the Sixers would sweep their way to the title in the minimum 12 games. He was almost right, as a six-point loss to the Milwaukee Bucks in the conference finals was the team’s only blemish during the run. Despite his phenomenal play during that epic title run, in three years, Malone was no longer a Sixer. In June 1986, he was shipped to Washington, where he spent two years, averaged ~22- 11, and became the third player in Bullets’ history to score at least 50 points in a game. Prior to the 1988-89 season, Malone signed with the Atlanta Hawks, with whom he had the last two excellent seasons of his career (20.2- 11.8 in 1988-89 and 18.9- 10 in 1989-90) and a quiet third campaign (10.6- 8.1) in 1990-91. He left the Hawks in 1991, spent two seasons with the Milwaukee Bucks and another back in Philly, before ending his career as a backup with the San Antonio Spurs. See what I’m sayin’? Two brilliant decades and it’s impossible to definitively link Moses Malone to any one NBA franchise. There’s a case to be made for the Sixers, though he was at his individual best while with the Rockets. And while the Rockets and (unofficially) the Sixers have retired his number, in the history of the three franchises with whom he was at his best (Rockets, Sixers, Bullets), thanks to Wilt Chamberlain, Hakeem Olajuwon and Wes Unseld, Malone has no chance of being remembered as the best-ever big man. Bad timing. Let’s face it, unless Moses Malone is as concerned with how he’s remembered as myself and other NBA historians are, I’d imagine he’s fairly satisfied with the way his career turned out. However, from a recognition standpoint, a few uncontrollable factors did work against him. First, he was a couple of years late in joining the ABA. Had he simply been born two or three years earlier and been a part of the league in its healthier days, today his ABA legacy might enjoy the same mythical status as those of Julius Erving and George Gervin, neither of whom was a decidedly better player. Also, once he did blossom into a bona fide star in the post-merger NBA, he did so in front of a limited audience. In the late 1970s, thanks to the pre-Magic and Bird malaise, along with a mainstream belief that NBA was “too black” and that drug abuse was rampant among the players, the popularity of pro basketball in America was extremely low. Cable TV and the kind of popularity that would justify nationally televised NBA games were still a ways off. As a result, even those fans that did want to watch had a tough time catching even the highest-profile games. It’s been pointed out countless times before, but the NBA was held in such low esteem in late-70s America that the Finals, the flagship event that crowned the league’s champion each year, was relegated to tape delay. To make matters worse, the world was still decades from League Pass, the internet and DVR, making pro basketball largely a regional sport. As a result, the few NBA stars that received significant nationwide media coverage were those in the largest media markets- Los Angeles and the Northeast. While Houston has long been among the largest American cities, in terms of both population and commercial activity, it’s never been considered a media hub, which resulted in some of Malone’s best individual seasons unfolding in relative obscurity. Had the entirety of Malone’s career been spent in New York or Philadelphia, it’s conceivable that he’d have the kind of larger-than-life legacy enjoyed by lesser players that starred in those cities. You probably thinking, “Hey, what the hell are you talking about? The guy won two MVP awards in Houston!” Indeed he did. But how many fans actually know that? This guy’s got as many MVP trophies in his home (assuming that’s where he keeps them) as Magic Johnson and Larry Bird (assuming they keep theirs at home too). Ask a casual fan, “Who’s won more MVP awards, Dr. J or Moses Malone?” A shocking number will confidently give you the wrong answer. Media un-friendliness. This is not what you think. By all accounts, Malone was neither inaccessible nor a bad guy when it came to dealing with the communities in which he played, or the reporters that covered him. This fatal flaw had more to do with presentation than personality. He didn’t have Julius Erving’s smooth, articulate style. Nor did he have George Gervin’s outgoing personality and sense of humor, accompanied by that cackling laugh. Where Dr. J could eloquently describe the feeling of rising above a crowd of players, or Gervin would describe his patented finger roll with a giggle and a smile, Malone was unable to accurately paint a picture of what it felt like to be the greatest rebounder of his generation, his interview answers often short and/or mumbled. With a financially underprivileged upbringing in Petersburg, Virginia (as of 2000, median income of ~$29,000 and almost 20% of population living below the poverty line) and his leap to the NBA straight out of high school, formal education did factor significantly into Moses Malone’s development. As a result, he didn’t enter the public eye with the communication skills, or the confidence in whatever communication skills he did have, to become a media darling. So there’s our look back. Hardly comprehensive, but hopefully informative. I can only hope that this inspires some of you to delve more deeply into the career of Moses Malone. If not, I hope that these 2,000 words will inspire a moment of reflection as the superstars of today take aim the lofty achievements of the most underappreciated superstar of the past 40 years.